Why Can Matplotlib Be Confusing? Pylab: What Is It, and Should I Use It? A picture is worth a thousand words, and with Python’s matplotlib library, it fortunately takes far less than a thousand words of code to create a production-quality graphic. However, matplotlib is also a massive library, and getting a plot to look just right is often achieved through trial and error. Using one-liners to generate basic plots in matplotlib is fairly simple, but skillfully commanding the remaining 98% of the library can be daunting. This article is a beginner-to-intermediate-level walkthrough on matplotlib that mixes theory with examples. While learning by example can be tremendously insightful, it helps to have even just a surface-level understanding of the library’s inner workings and layout as well. 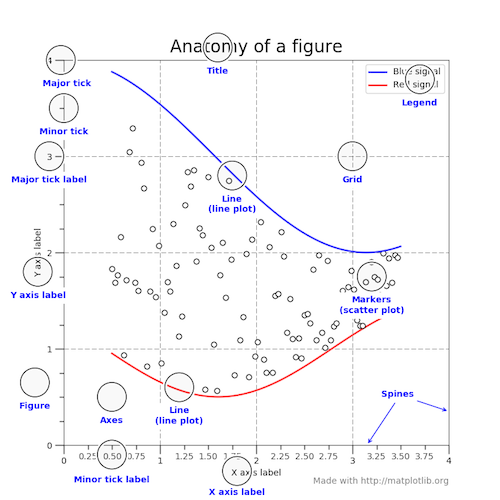 Pylab and pyplot: which is which? Free Bonus: Click here to download 5 Python + Matplotlib examples with full source code that you can use as a basis for making your own plots and graphics. This article assumes the user knows a tiny bit of NumPy. We’ll mainly use the numpy.random module to generate “toy” data, drawing samples from different statistical distributions. If you don’t already have matplotlib installed, see here for a walkthrough before proceeding. The library itself is huge, at something like 70,000 total lines of code. While it is comprehensive, some of matplotlib’s own public documentation is seriously out-of-date. The library is still evolving, and many older examples floating around online may take 70% fewer lines of code in their modern version. So, before we get to any glitzy examples, it’s useful to grasp the core concepts of matplotlib’s design. One relevant feature of MATLAB is its global style. The Python concept of importing is not heavily used in MATLAB, and most of MATLAB’s functions are readily available to the user at the top level. Knowing that matplotlib has its roots in MATLAB helps to explain why pylab exists. pylab is a module within the matplotlib library that was built to mimic MATLAB’s global style. 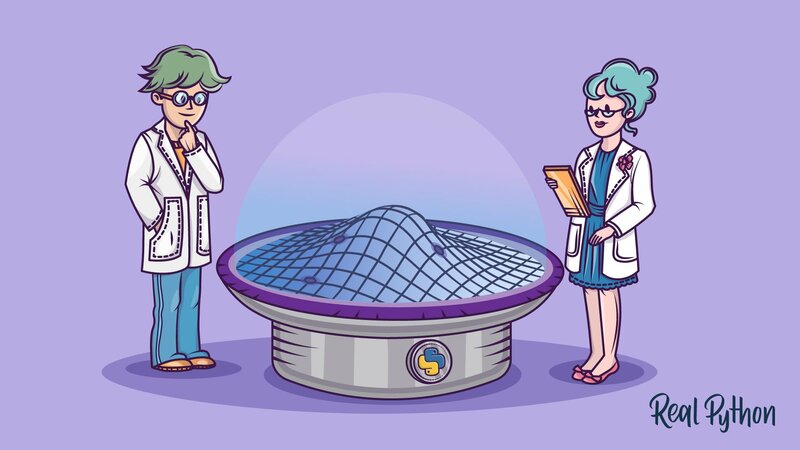 It exists only to bring a number of functions and classes from both NumPy and matplotlib into the namespace, making for an easy transition for former MATLAB users who were not used to needing import statements. Ex-MATLAB converts (who are all fine people, I promise!) liked this functionality, because with from pylab import *, they could simply call plot() or array() directly, as they would in MATLAB. Internally, there are a ton of potentially conflicting imports being masked within the short pylab source. In fact, using ipython --pylab (from the terminal/command line) or %pylab (from IPython/Jupyter tools) simply calls from pylab import * under the hood. The bottom line is that matplotlib has abandoned this convenience module and now explicitly recommends against using pylab, bringing things more in line with one of Python’s key notions: explicit is better than implicit. One important big-picture matplotlib concept is its object hierarchy. If you’ve worked through any introductory matplotlib tutorial, you’ve probably called something like plt.plot([1, 2, 3]). This one-liner hides the fact that a plot is really a hierarchy of nested Python objects. A “hierarchy” here means that there is a tree-like structure of matplotlib objects underlying each plot. 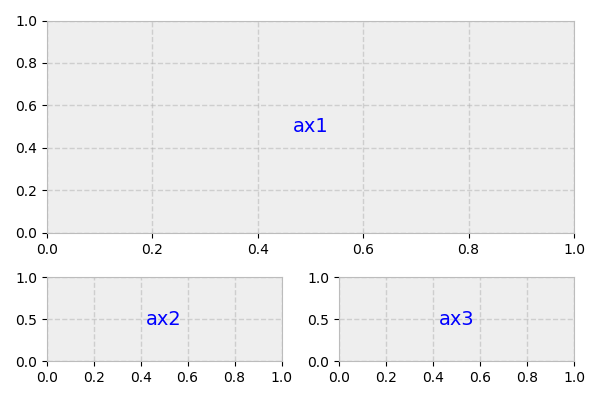 A Figure object is the outermost container for a matplotlib graphic, which can contain multiple Axes objects. 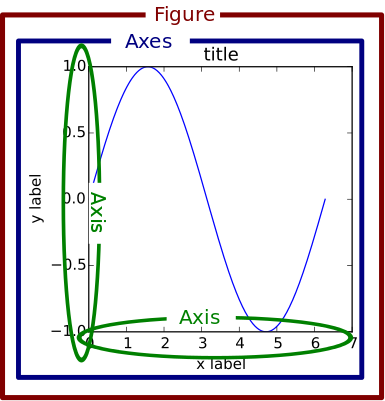 One source of confusion is the name: an Axes actually translates into what we think of as an individual plot or graph (rather than the plural of “axis,” as we might expect). Above, fig (a Figure class instance) has multiple Axes (a list, for which we take the first element). Each Axes has a yaxis and xaxis, each of which have a collection of “major ticks,” and we grab the first one. Alright, we need one more chunk of theory before we can get around to the shiny visualizations: the difference between the stateful (state-based, state-machine) and stateless (object-oriented, OO) interfaces. Above, we used import matplotlib.pyplot as plt to import the pyplot module from matplotlib and name it plt. The stateful interface makes its calls with plt.plot() and other top-level pyplot functions. There is only ever one Figure or Axes that you’re manipulating at a given time, and you don’t need to explicitly refer to it. Modifying the underlying objects directly is the object-oriented approach. We usually do this by calling methods of an Axes object, which is the object that represents a plot itself. Tying these together, most of the functions from pyplot also exist as methods of the matplotlib.axes.Axes class. ...     """An abridged version of plt.plot().""" ...     """Get the current Axes of the current Figure.""" Calling plt.plot() is just a convenient way to get the current Axes of the current Figure and then call its plot() method. This is what is meant by the assertion that the stateful interface always “implicitly tracks” the plot that it wants to reference. gca() grabs the current axis and returns it. set_title() is a setter method that sets the title for that Axes object. The “convenience” here is that we didn’t need to specify any Axes object explicitly with plt.title(). Alright, enough theory. Now, we’re ready to tie everything together and do some plotting. From here on out, we’ll mostly rely on the stateless (object-oriented) approach, which is more customizable and comes in handy as graphs become more complex. After creating three random time series, we defined one Figure (fig) containing one Axes (a plot, ax). We call methods of ax directly to create a stacked area chart and to add a legend, title, and y-axis label. Under the object-oriented approach, it’s clear that all of these are attributes of ax. tight_layout() applies to the Figure object as a whole to clean up whitespace padding. We deal with ax1 and ax2 individually, which would be difficult to do with the stateful approach. 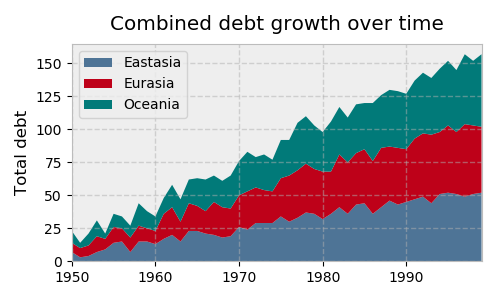 The final line is a good illustration of the object hierarchy, where we are modifying the yaxis belonging to the second Axes, placing its ticks and ticklabels to the right. Text inside dollar signs utilizes TeX markup to put variables in italics. We could’ve also done this with ((ax1, ax2), (ax3, ax4)) = ax, but the first approach tends to be more flexible. To illustrate some more advanced subplot features, let’s pull some macroeconomic California housing data extracted from a compressed tar archive, using io, tarfile, and urllib from Python’s Standard Library. Above, what we actually have is a 3x2 grid. ax1 is twice the height and width of ax2/ax3, meaning that it takes up two columns and two rows. Above, colorbar() (different from ColorMap earlier) gets called on the Figure directly, rather than the Axes. Its first argument is the result of ax1.scatter(), which functions as a mapping of y-values to a ColorMap. 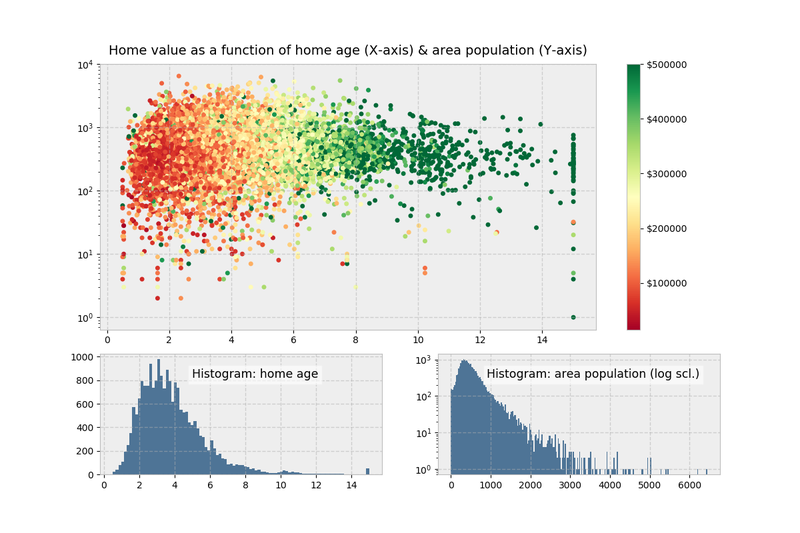 Visually, there isn’t much differentiation in color (the y-variable) as we move up and down the y-axis, indicating that home age seems to be a stronger determinant of house value. >>> id(plt.gcf())  # `fig1` is the current figure. >>> id(fig2) == id(plt.gcf())  # The current figure has changed to `fig2`. Methods that get heavy use are imshow() and matshow(), with the latter being a wrapper around the former. These are useful anytime that a raw numerical array can be visualized as a colored grid. The pandas library has become popular for not just for enabling powerful data analysis, but also for its handy pre-canned plotting methods. Interestingly though, pandas plotting methods are really just convenient wrappers around existing matplotlib calls. That is, the plot() method on pandas’ Series and DataFrame is a wrapper around plt.plot(). One convenience provided, for example, is that if the DataFrame’s Index consists of dates, gcf().autofmt_xdate() is called internally by pandas to get the current Figure and nicely auto-format the x-axis. In turn, remember that plt.plot() (the state-based approach) is implicitly aware of the current Figure and current Axes, so pandas is following the state-based approach by extension. ma is a 90-day moving average of the VIX Index, a measure of market expectations of near-term stock volatility. state is a binning of the moving average into different regime states. 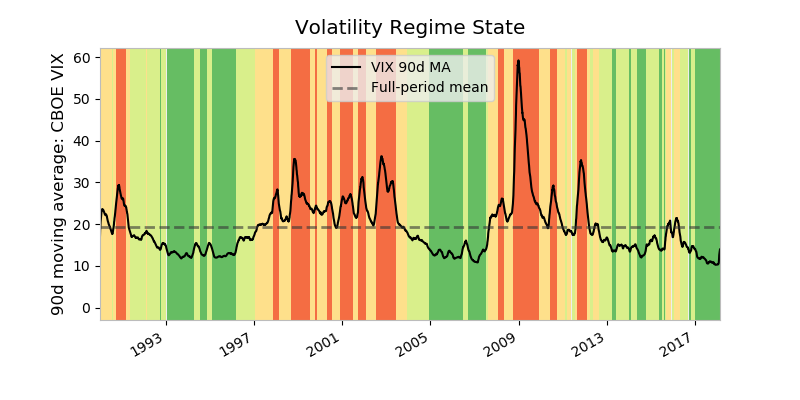 A high VIX is seen as signaling a heightened level of fear in the marketplace. cmap is a ColorMap—a matplotlib object that is essentially a mapping of floats to RGBA colors. Any colormap can be reversed by appending '_r', so 'RdYlGn_r' is the reversed Red-Yellow-Green colormap. 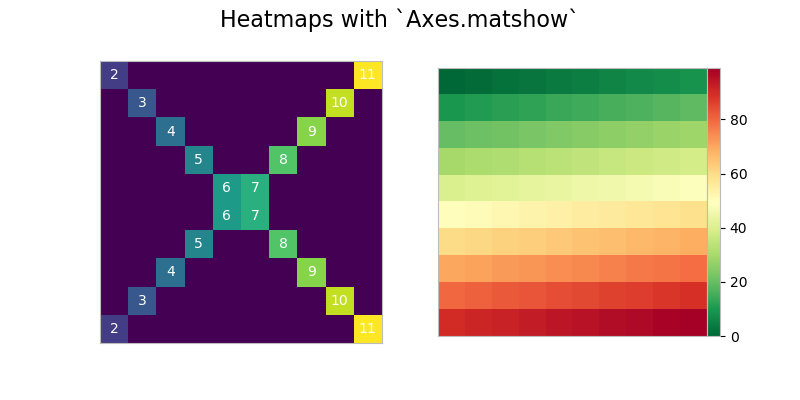 Matplotlib maintains a handy visual reference guide to ColorMaps in its docs. The only real pandas call we’re making here is ma.plot(). 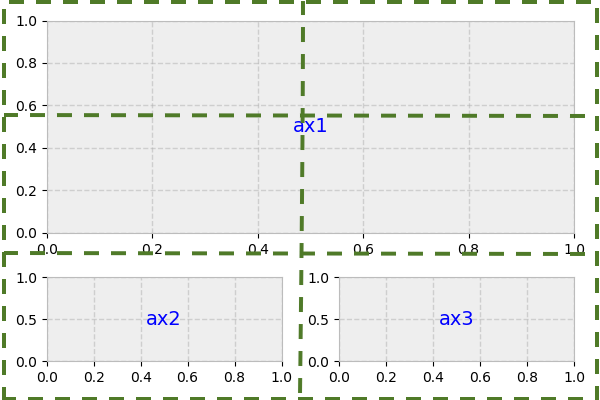 This calls plt.plot() internally, so to integrate the object-oriented approach, we need to get an explicit reference to the current Axes with ax = plt.gca(). The second chunk of code creates color-filled blocks that correspond to each bin of state. cmap([0.2, 0.4, 0.6, 0.8]) says, “Get us an RGBA sequence for the colors at the 20th, 40th, 60th, and 80th ‘percentile’ along the ColorMaps’ spectrum.” enumerate() is used because we want to map each RGBA color back to a state. Pandas also comes built-out with a smattering of more advanced plots (which could take up an entire tutorial all on their own). However, all of these, like their simpler counterparts, rely on matplotlib machinery internally. As shown by some of the examples above, there’s no getting around the fact that matplotlib can be a technical, syntax-heavy library. Creating a production-ready chart sometimes requires a half hour of Googling and combining a hodgepodge of lines in order to fine-tune a plot. However, understanding how matplotlib’s interfaces interact is an investment that can pay off down the road. 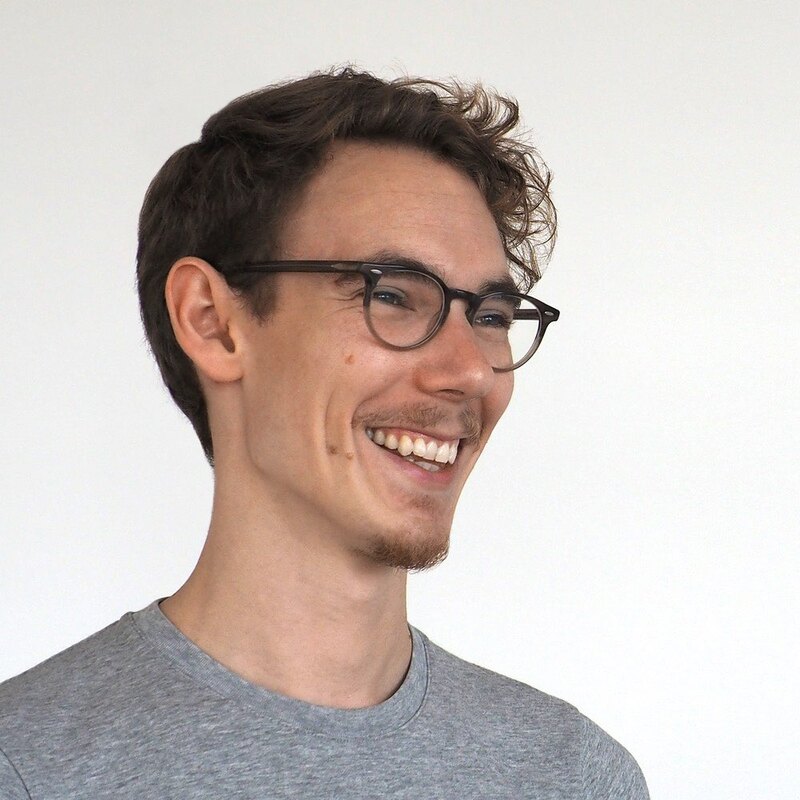 As Real Python’s own Dan Bader has advised, taking the time to dissect code rather than resorting to the Stack Overflow “copy pasta” solution tends to be a smarter long-term solution. Sticking to the object-oriented approach can save hours of frustration when you want to take a plot from plain to a work of art. Chapter 9 (Plotting & Visualization) of Wes McKinney’s Python for Data Analysis, 2nd ed. If you’ve been following along with this tutorial, it’s likely that the plots popping up on your screen look different stylistically than the ones shown here. By changing your configuration parameters interactively, or from a .py script. A matplotlibrc file (Option #1 above) is basically a text file specifying user-customized settings that are remembered between Python sessions. On Mac OS X, this normally resides at ~/.matplotlib/matplotlibrc. Quick Tip: GitHub is a great place to keep configuration files. I keep mine here. Just make sure that they don’t contain personally identifiable or private information, such as passwords or SSH private keys! plt.rcdefaults() restores the rc parameters from matplotlib’s internal defaults, which are listed at plt.rcParamsDefault. This will revert (overwrite) whatever you’ve already customized in a matplotlibrc file. 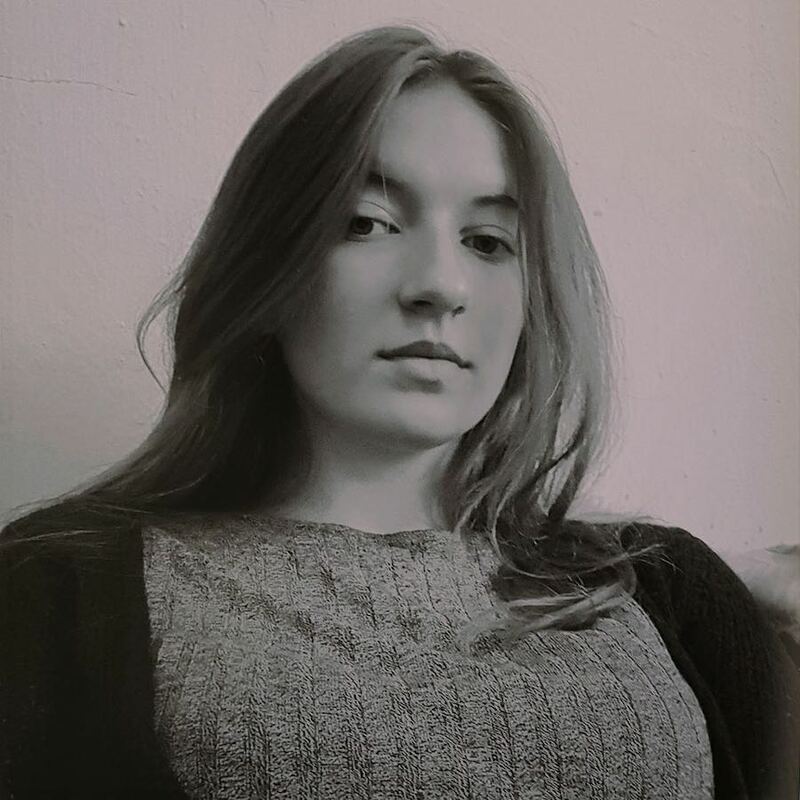 plt.rc() is used for setting parameters interactively. plt.rcParams is a (mutable) dictionary-like object that lets you manipulate settings directly. If you have customized settings in a matplotlibrc file, these will be reflected in this dictionary. Notably, the Figure class then uses some of these as its default arguments. This full example is available here. 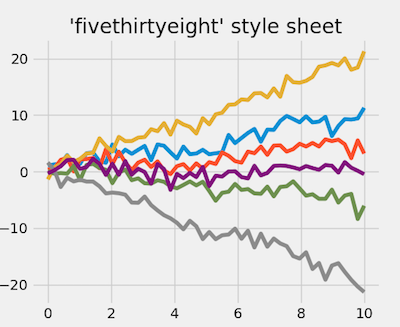 For inspiration, matplotlib keeps some style sheet displays for reference as well. Behind the scenes, matplotlib also interacts with different backends. A backend is the workhorse behind actually rendering a chart. (On the popular Anaconda distribution, for instance, the default backend is Qt5Agg.) Some backends are interactive, meaning they are dynamically updated and “pop up” to the user when changed. If interactive mode is on, you don’t need plt.show(), and images will automatically pop-up and be updated as you reference them. If interactive mode is off, you’ll need plt.show() to display a figure and plt.draw() to update a plot. Notably, interactive mode has nothing to do with what IDE you’re using, or whether you’ve enable inline plotting with something like jupyter notebook --matplotlib inline or %matplotlib. 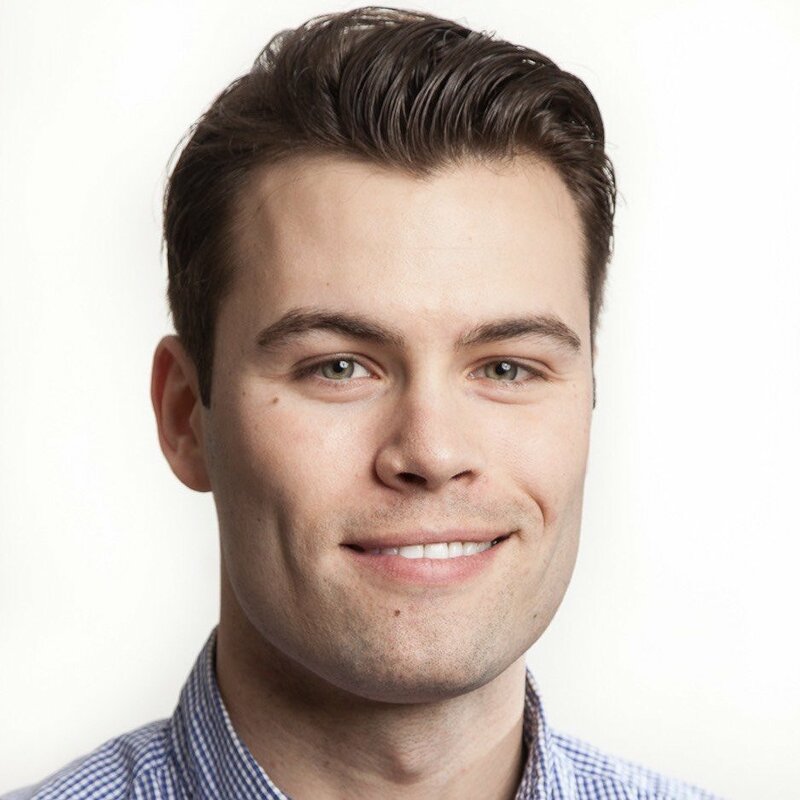 Brad is a software engineer and a member of the Real Python Tutorial Team.